Quilting with machine embroidery can make creating beautiful quilts a little easier. Quilting with machine embroidery is an easy way to finish off the top of a quilt or be creative with quilt blocks. With the popularity of personal embroidery machines increasing, many quilters find it cost-effective to quilt their own projects instead of sending them to a professional. Also, for those who quilt by hand, this process can get the job done in a fraction of the time. Machine guided: This technique, which uses your machine's feed dogs, is for straight and slightly curved lines. It is used with a walking foot and sews about 12 stitches per inch. Free motion: This type of quilting, where the feed dogs are dropped or covered up, normally doesn't follow straight lines. You can use different feet with it, but a darning foot works well. This foot jumps up and down with the needle, allowing you to easily move the fabric. Embroidery Online offers a wide choice of delicate and beautiful quilting designs for purchase. Erica's Embroidery Designs has both simple and complex designs. Splinters and Threads has some basic patterns for sports, feathers, and other miscellaneous designs. Golden Threads motto is, "Designs that make every quilt a work of art," and the ones listed on the Web site show just that. Everything from complete quilting packages to miniature designs is offered. Some will find quilting with machine embroidery a breeze, while others won't like it all. It cuts back on time it would take to hand-embroider the item. 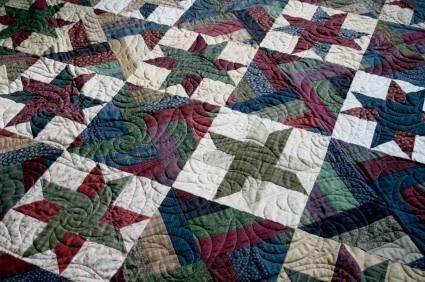 It can be cost-effective because doing the quilting at home is cheaper than having a professional do it. Learning a new craft may be hard work, but it is fun. Quilting with machine embroidery does not work with every style of quilt. Making a mistake can be costly, especially if the machine snags, rips or puckers the fabric. If you are a novice quilter, a professional can embroider your quilt quicker and more efficiently. If you are using a basic sewing machine, the easiest way to get the design onto your quilt is to trace it onto tissue or other lightweight paper. Pin the paper to the quilt and sew on the lines. Tear the paper away when you are done. Add a folding or cart table next to your sewing table to help support the heavy quilt. Practice on scraps pieces of fabric before quilting your final product. If you are a beginner, take a quilting class from your local craft store or community college.